Proposals are nerve-wracking for anyone – but for many men they likely have just become a whole lot scarier. Apparently, there are certain specific requirements women like their suitor to fulfill for their proposal. 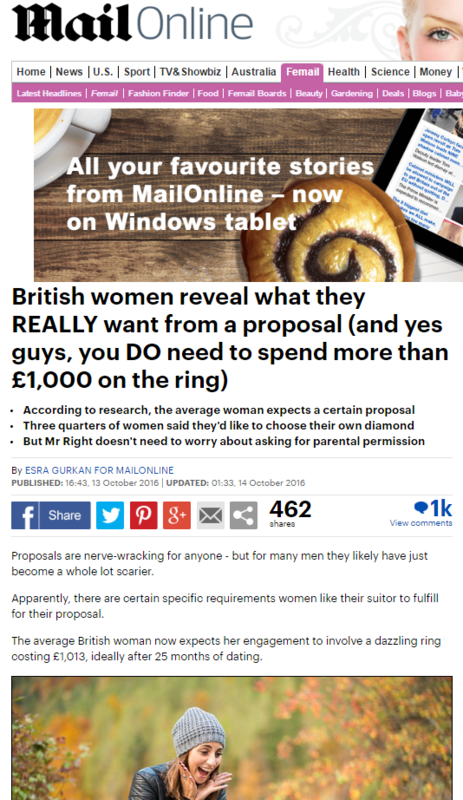 The average British woman now expects her engagement to involve a dazzling ring costing £1,013, ideally after 25 months of dating. Craig Bolton, from jeweller Mappin & Webb, which commissioned the survey of 2,000 unmarried women, says: ‘The results of our survey should give the men of the UK plenty of food for thought. ‘The winter and Christmas period is a very popular time of year for proposals to take place, so if any men or women are thinking of popping the question now’s the time to do it. The reason behind women wanting to pick their own ring is because over a third think their man would make the wrong ring choice if left to his own devices. The most popular type of ring is a solitaire (round) cut diamond on a white gold band. Just one in 20 opt for an unusual stone like a ruby or emerald. It’s not all bad news for would-be fiances though… Fewer than one in five women have every detail of their perfect proposal mapped out in their mind – which gives men quite a lot of room for error. And to think, they said romance was dead. This entry was posted in Mappin & Webb on November 4, 2016 by Michael Marshall.